California Association of Realtors® reports that 90% of buyers end up doing business with the first person who responds. A 5 minute response time to a lead should be your benchmark to maximize your lead conversion. So what is your current response time? 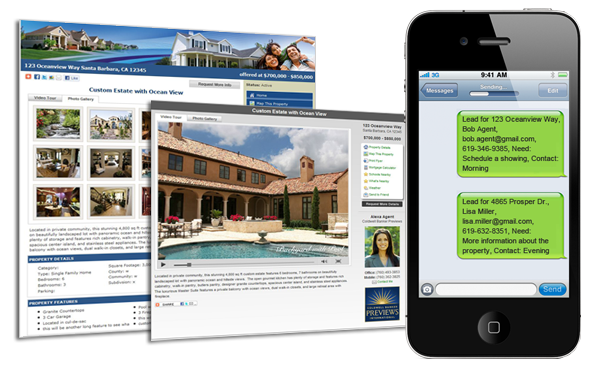 By using our system, the eMarketing we generate for your listings will bring in more leads for you. For your agent website and every one of your listing's property website and virtual tour, we provide a contact form that allows a visitor to contact you for more information. This lead is captured into our system. Whether you are on the road, in the office, or at home, we want you to get your leads immediately. We know how important it is to respond quickly to a lead. Not only will we notify you by email, but we will send you a text message to your mobile device giving you instant notification and allowing you to respond faster to your leads. With all the leads you will receive we want to make sure you do not miss one. By giving you the necessary management tools, you will ensure you have responded to every lead. No credit card needed! Signup takes seconds! Receive a FREE 15 day trial to our Premium membership. After your trial, you will automatically be converted to our Free membership account. Copyright © 2019 eAgent360. All rights reserved.